That quote comes from former Miami Dolphin cornerback Don McNeal. A player perhaps most remembered for a tackle he missed in Super Bowl XVII is now fighting multiple sclerosis. The incurable disease has begun to sap his mobility. McNeal is now forced to get around on a scooter given to him by his in-laws. McNeal, ever the optimist, refuses to feel down about it. McNeal, now 57, will head back to his native Atmore, Alabama next week. 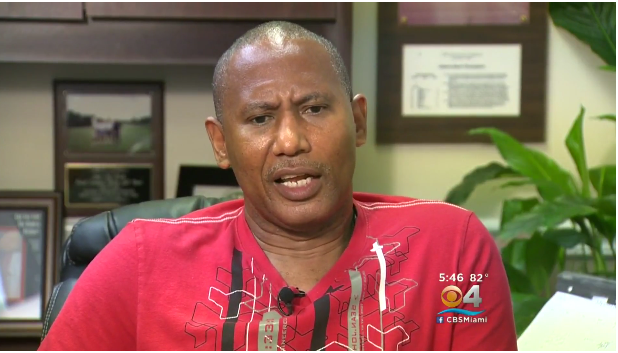 The town will host a walk and run in his honor to raise funds in the fight against MS.
McNeal, a man of deep religious faith, still spends three days a week at Dade Christian School in Miami Lakes. He’s the former pastor of its adjoining church, and his wife Rhonda serves as the school’s admissions officer. McNeal believes repeated NFL concussions brought on his ailment. He is among a slew of former players suing the league for damages. McNeal wants empathy, not sympathy.